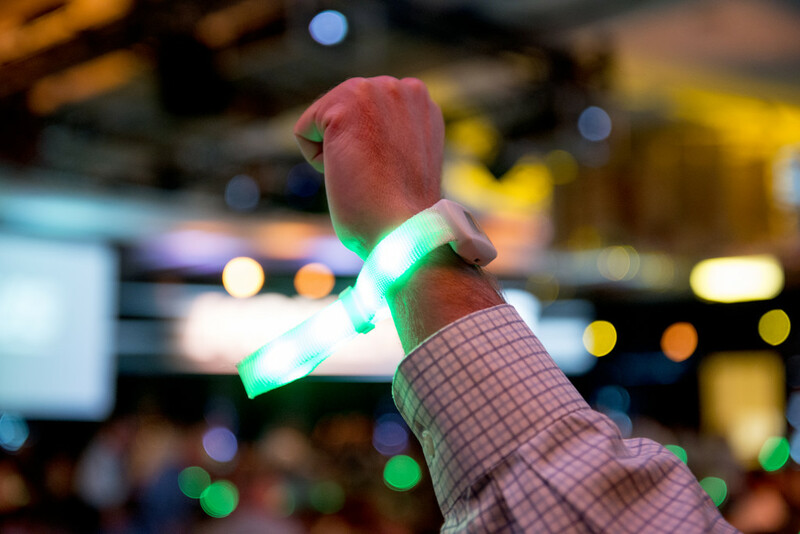 Recently the Mo team was lucky enough to field test an emerging technology, the Xyloband. Worn around the wrist, the band consists of full-color LED lights, wrapped in a comfortable cloth band and secured by a small (brand-able) battery pack. The rest of the system is comprised of several RFID antennae, control software and a full-time technician to run the cues. The process is fairly simple. Once the antennae are set in specific zones to ensure no band is ever out of coverage, the technician gets to work coding each band, giving it a unique identifier. The process is tedious, but by coding individual bands, the programmer is able to use the bands is several unique ways. One of the most popular ways to employ the bands is to use them as visual cues. Imagine being able to quote a figure like “48% of patients suffer from this symptom” and then lighting up 48% of the audience. The ability for the audience to immediately associate a number with a visual cue can really bring the message home. Scheduling is another useful process the Xylobands can accommodate. During the many breaks throughout a multi-day event, getting attendees back to the rooms at a specific time can be difficult. Digital signage and audio announcements may be missed by some. Using the Xylobands to let the attendees know when it’s time to return is quick and thorough. Yellow for five minutes out, orange for one, and red when it is time to return. Each individual receives the message, and even if they don’t see their own band, they are sure to see someone else’s. Some of the other features are more about getting the crowd excited. Like, hooking the system directly up to midi so that the bands flash in sequence with the house music. Or, matching the color palette of your event. The bands can be manipulated in both brightness and hue to match almost any color. The final product was incredibly entertaining and well received with both the client and the audience.